It’s an exciting time for the millions of fans whose hearts broke when “Arrested Development” was cancelled a few years back! 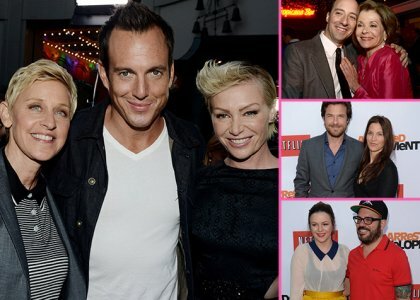 Last night (April 29) the beloved cast showed up at the Chinese Theater in Los Angeles for a swanky shindig to celebrate the arrival of Season 4. Jason Bateman hobnobbed with costars David Cross, Jessica Walter, Tony Hale, Alia Shawkat, Michael Cera, Portia de Rossi, Will Arnett, Jeffrey Tambor, and Judy Greer ahead of the May 26th kickoff. Meanwhile, it’s just been announced that John Krasinski will join the cast of “Arrested Development” during the course of the new 15-episode run, though there’s no word on his role or the frequency of his character in the storyline.